The U.S. $20 Saint-Gaudens Gold Double Eagles are coins of mystery and intrigue. They were never officially released by the United States Mint, however, a few of them were circulating in the underground rare coin market. Several of them were confiscated by the government and only one is legal to own. The U.S. $20 Gold Double Eagle, Saint-Gaudens type, had been issued from 1907 until 1932. Although 445,500 Double Eagles had been minted with the 1933 date, not one was released into circulation because of changes made to currency laws during the Great Depression. In an effort to end the run on the banks and stabilize the economy, President Franklin Roosevelt took America off the gold standard. Not only were no more gold coins to be issued for circulation, but people also had to turn in the ones they had. It became illegal for private citizens to own gold coins unless they clearly had a collectible value. This law was enacted during desperate times to prevent the hoarding of gold currency. Since there would be no more gold currency issued in the U.S., the Mint had melted down the 1933 run of Gold Double Eagles and converted them to gold bullion bars by 1937. Two of the 1933 specimens were given by the Mint to the U.S. National Numismatic Collection at the Smithsonian Institute. These were the only two legal specimens to ever become part of a coin collection. However, by 1952, the Secret Service had confiscated 8 more 1933 Double Eagles! How did they leave the Mint? Why weren't they melted down? Was the 1933 Double Eagle Switched for Another Coin? We may never know for certain how these coins left the Mint, but there is a general consensus among scholars that a Mint cashier by the name of George McCann exchanged about 20 1933's doomed for destruction and replaced them with earlier dated Double Eagles. This way, the accounting books would balance and nobody would realize that anything was amiss. What we do know for sure is that a Philadelphia area jeweler by the name of Israel Switt came into possession of at least 19 of the coins. Israel Switt sold at least nine of the 1933 Double Eagles privately to collectors, one of which found its way into the collection of King Farouk of Egypt. When the Secret Service discovered that these coins had surfaced, they confiscated all of them because they were considered to be stolen property of the U.S. Mint. However, King Farouk had legally exported his coin before the theft was discovered, and the Secret Service was unable to recover his specimen through diplomatic channels. After King Farouk was deposed in 1952, his 1933 Double Eagle briefly appeared on the market, but when it became clear that U.S. authorities still wanted to confiscate it, it vanished again! More than 40 years later, British coin dealer Stephen Fenton showed up with it in New York, and the Secret Service finally seized it during a sting operation during which they purportedly negotiated to purchase the coin. Fenton fought a several year-long legal battle in the U.S. courts over ownership of the coin, during which time which it was stored in the Treasury Vaults at the World Trade Center. A mere two months before the terrorist attacks of September 11, 2001, the lawsuit was settled and the Double Eagle was moved to Fort Knox. Fenton and the U.S. Mint had come to a compromise: the coin would be sold at auction, with the proceeds split between the Fenton and the Mint. 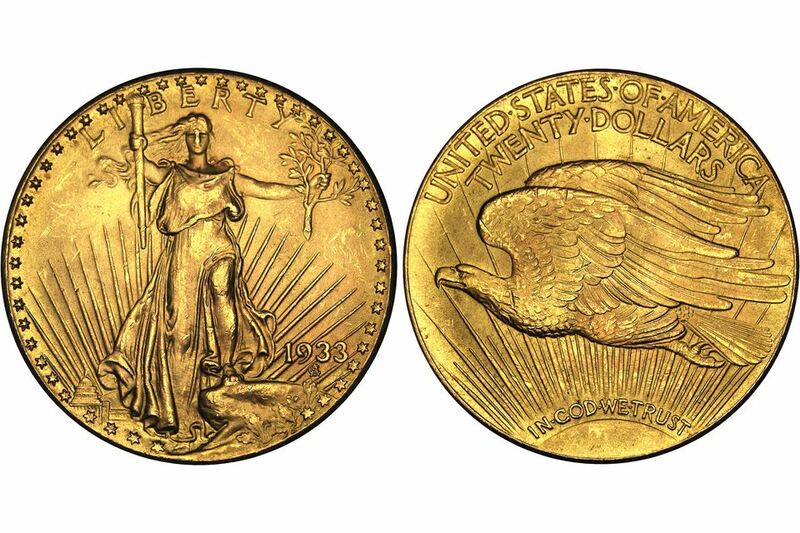 The 1933 Double Eagle sold at auction on July 30, 2002, for $6.6 million, plus the 15% buyer's fee, which brought the total cost to the buyer to $7,590,000, plus $20 to monetize the coin and compensate the Mint for the $20 it believes it lost when the coin was thought to have been stolen. At that time this was a world record for purchasing a single coin. The buyer chose to remain anonymous and it is currently on display at The New-York Historical Society and Library, on temporary loan from an anonymous private collection.. One thing is for sure: the Secret Service can't confiscate it anymore! In September of 2004, Joan Langbord, one of Israel Switt's heirs, discovered ten more specimens of the 1933 Double Eagle amongst his effects. Apparently unaware of the legal status of these coins (or perhaps just a bit too trusting of the government) she sent all ten specimens to the U.S. Mint to have them authenticated. The Secret Service declared the coins genuine and seized them. This began a decade's long legal fight between the government and the Langbord. A lower court ruled that the coins were the property of the United States government and therefore considered stolen property. Langbord appealed the ruling several times all the way up to the United States Supreme Court. In April 2017, the United States Supreme Court declined to hear the case which ended the legal battle and left the ten 1933 Double Eagles in the custody of the government. On May 10, 2018, Greg Weinman, the U.S. Mint’s senior legal counsel, stated during a presentation at the Pennsylvania Association of Numismatists spring show that the government is aware of another example. Several weeks later the mint acknowledged that the coin was surrendered by an anonymous collector. It joined the other ten specimens under the care and protection of Fort Knox. Is the 1933 Double Eagle Still the World's Most Valuable Coin? It will be interesting to see, should the 10 Langbord coins ever come to market, if the 1933 Double Eagle will retain its place as the world's highest priced coin when the number of available specimens increases ten-fold. On January 24, 2013, Stacks Bowers Gallery sold a 1794 Flowing Hair silver dollar for over $10 million ($10,016,875 including the buyer's fee). On May 24, 2016 Stacks Bowers Gallery will sell the finest known 1804 silver dollar from the D. Brent Pogue collection. Many experts think that this may become the world's new most expensive coin. Which Gold Coins Should You Invest In? Find Out What MCMLXXXVI Means on Gold Coins?